Fumonisins are economically important mycotoxins which until recently were considered to originate from only a few Fusarium species. However recently a putative fumonisin gene cluster was discovered in two different Aspergillus niger strains followed by detection of an actual fumonisin B2 (FB2) production in four strains of this biotechnologically important workhorse. In the present study, a screening of 5 A. niger strains and 25 assumed fumonisin producing Fusarium strains from 6 species, showed that all 5 A. niger strains produced FB2 and 23 of 25 Fusarium produced fumonisin B1 and other isoforms (fumonisin B2 and B3). Five A. niger and five Fusarium spp. were incubated at six different temperatures from 15-42°C on Czapek Yeast Agar +5% salt or Potato Dextrose Agar. A. niger had the highest production of FB2 at 25-30°C whereas Fusarium spp. had the maximal production of FB1 and FB2 at 20-25°C. Addition of 2.5-5% NaCl, or 10-20% sucrose increased the FB2 production of A. niger, whereas addition of glycerol reduced FB2 production. All three water activity lowering solutes reduced the fumonisin production of the Fusarium species. The present study shows that the regulation of fumonisin production is very different in A. niger and Fusarium, and that food and feeds preserved by addition of sugar or salts may be good substrates for fumonisin B2 production by A. niger. The fumonisins were discovered in 1988 and are divided in four series A, B, C, P [1–3]with the B1 (FB1), B2 (FB2) and B3 (FB3) as the most abundant naturally occurring homologues [4, 5]. They were first isolated from Fusarium verticillioides (= F. moniliforme pro parte ) strain MRC 826 by Gelderblom et al. . FB1 is mainly produced by F. verticillioides and F. proliferatum . However, production of type B fumonisins by other Fusarium spp. has also been reported, e.g. from F. dlaminii, F. napiforme, F. nygamai and F. oxysporum [8–10]. Fumonisins are important mycotoxins because they are suspected to cause human and animal toxicoses by the consumption of contaminated corn-based food and feeds . Fumonisins have been shown to induce outbreaks of equine leukoencephalomalacia in horses and pulmonary edema and hydrothorax in pigs [5, 12]. The fumonisins are structurally similar to sphingolipids and have shown to inhibit the sphingolipid biosynthesis via the ceramide synthase pathway [13, 14]. To avoid possible health risks, the U.S. Food and Drug Administration recommends that corn products should not be used for human consumption when contaminated with more than 2-4 mg/kg total fumonisins (depending on the product) . whereas EEC has a regulatory limit of 0.2-2 mg/kg (depending on the product) . Fumonisins produced by Fusarium species have been isolated from corn  and corn based products  such as tortillas  and beer , as well as other commodities like rice , black tea leaves , asparagus  and pine nuts . 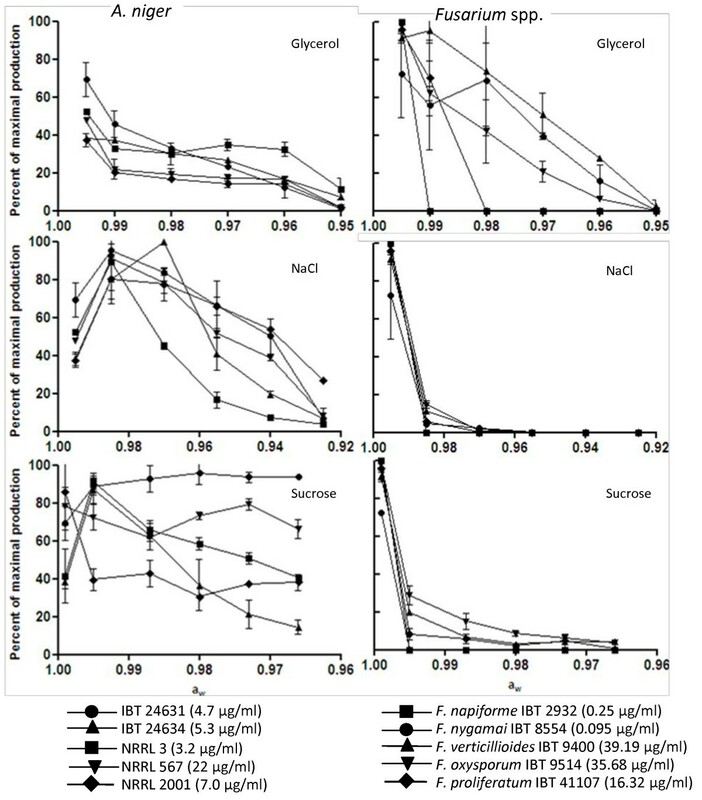 Factors that affect the production of fumonisins in Fusarium have been well studied, and include solid substrates , liquid substrates , temperature [25–27], water activity (aw) [27, 28], pH , addition of nitrogen repressor , aeration of the substrate  and addition of fumonisin precursors , but often corn kernels have been used as substrate since corn is the primary crop infected with F. verticillioides. Recently putative homologues to the F. verticillioides fumonisin gene cluster were found in two different Aspergillus niger genomes [32, 33], and it was subsequently shown that three full genome sequenced strains and the ex type strain of A. niger actually can produce FB2 in comparable amounts to Fusarium strains  when grown on agar substrates with high amounts of sugar, glycerol or NaCl. This was followed by the discovery of additional FB4 production (~20% the amount of FB2) by A. niger  in agar cultures and naturally A. niger contaminated Thai coffee beans . The objectives of the present work were to i) screen A. niger and Fusarium strains, for production of FB1, FB2 and FB3 on three different agar substrates, ii) investigate the effect of incubation temperature on the production of fumonisins and iii) study the effect of the solutes glycerol, NaCl and sucrose on the production of fumonisins. The current work is performed on agar media instead of natural substrates in order to more easily asses the water activity. The efficiency of five different extraction solvents to extract FB2 from A. niger (NRRL 567) varied significantly, with methanol:water (3:1) being most efficient, followed by acetonitrile:water (3:1) with a 20% lower efficiency and methanol:dichloromethane:ethyl acetate (1:2:3) (30% lower efficiency). The use of water (25°C) and hot water (100°C) was not suitable for extraction of FB2 from A. niger NRRL 567 with a relative efficiency of <1%, when compared to methanol:water. The most effective solvents concerning F. verticillioides IBT 9400 were acetonitrile:water (3:1) as the best followed by methanol:water (3:1)(98%) and water at room temperature with an efficiency of 93%. The use of hot water as extraction solvent was less efficient (76%), compared to methanol:water. The acidic methanol:dichloromethane:ethyl acetate (1:2:3), had the lowest extraction efficiency with 26%. The difference between each of the two replicates for all incidences was in the interval 1-40% with an average of 10%. The recovery of FB2 from two spiked non-FB2 producing strains showed a recovery of 75% ± 10% (IBT 20381) and 85% ± 10% (IBT 19345). The calibration curves from standards and spiked samples, used to calculate recovery from all had R2 better than 0.995. The relative standard deviation (RSD) of the extracted amounts of FB2 from the 8 isolates (n = 5) varied within 4-50%, with an average RSD of 20%. LOD were found to be 0.1 μg/cm2 fungal culture. The results from the screening experiment are shown in table 1. The A. niger strains were able to produce FB2 on all three substrates, with the highest production on RC and CYAS. None of the A. niger strains produced detectable amounts of neither FB1 nor FB3. LC-MS/MS analyses have shown that FB2 is produced along with FB4, although the amount of FB4 normally lies in the range 5-20% of the FB2 amounts . Fumonisin production by Aspergillus niger and Fusarium spp. on CYAS, PDA and RC after 7 days growth at 25°C. The concentration of FB2 was detected in the methanol:water (3:1) extract. The values are means of the replicates plus/minus the standard deviation. The replicates are made in biological duplicates on two separate plates. Of the A. niger strains, NRRL 567 had the highest production of FB2 on RC and CYAS. But on PDA the three strains, NRRL 567, NRRL 2001 and IBT 24631, produced very similar amounts of fumonisins, although lower than RC and CYAS. The FB2 production on RC and CYAS of A. niger NRRL 2001, IBT 24631 and 24634 differed only slightly, whereas FB2 production by the other two, NRRL 567 and NRRL 3 were clearly favored by growth on RC. All Fusarium spp. with the exception of the two F. dlaminii strains IBT 2937 and IBT 2938 produced fumonisins under these conditions. Six Fusarium strains, F. napiforme IBT 2932, F. proliferatum IBT 9109 and IBT 9337, F. verticillioides IBT 9496 and F. nygamai IBT 9395 produced amounts close to the detection limit of FB1 on RC; in addition IBT 2932 also produced fumonisins on PDA. F. nygamai IBT 2934, IBT 8554 and IBT 8557 showed a higher production of FB2 than FB1 on PDA (data not shown), and F. proliferatum IBT 9397 had the highest concentration of total fumonisin measured. Only seven strains had a total production of fumonisin above 1 μg/ml extract on RC compared to 14 strains on PDA. Seven Fusarium strains did not have any measurable production of FB1, FB2 nor FB3 on PDA compared to two non-producers on RC. On the other hand PDA supported production of higher amounts of fumonisins, strains which had a barely detectable amount of FB1 on RC, also showed production of either FB2 or both FB2 and FB3 on PDA. Strains for the next experiments were selected on the basis of the above mentioned experiments. Besides the five A. niger strains five Fusarium strains were selected, with both good and poor producers at 25°C, two strains with a high FB production, F. verticillioides IBT 9400 and F. oxysporum IBT 9514, one with an average FB production F. proliferatum IBT 41107, one with a low FB1 production F. napiforme IBT 2932 and a strain with a higher production of FB2 than FB1 F. nygamai IBT 8554 was selected. Only one of the A. niger strains was able to grow at 15°C, although very slowly (extensive data shown in [Additional file 1]). The growth increased at higher temperature and peaked at 30-37°C, followed by a slight reduction of the growth at 42°C. All Fusarium strains were able to grow at 15°C followed by an increased growth at higher temperatures and peaked at 25-30°C, above this temperature the growth decreased and no growth was observed at 42°C. 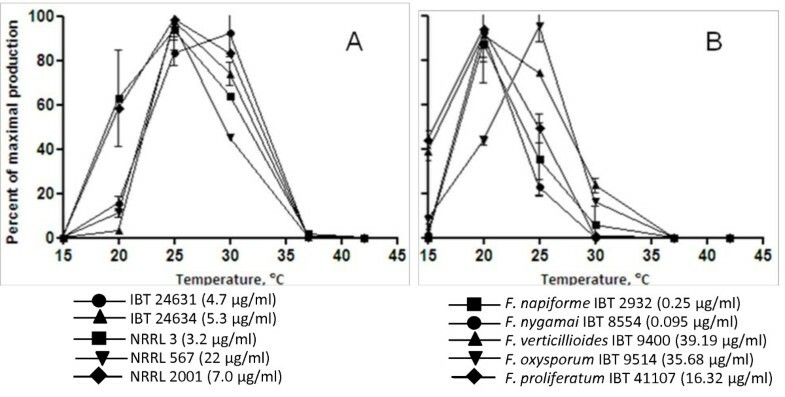 The effect of temperature on the production of FB2 by the five A. niger strains is shown in figure 1A. None of the isolates produced detectable amounts of FB2 at 42°C, even though all strains grew well. The only A. niger strain, NRRL 2001, that was able to grow at 15°C, did not have any detectable production of FB2. A: FB 2 production by Aspergillus niger after 7 days of growth at different temperatures (15-42°C) on CYAS. The concentration of FB2 was detected in the methanol:water (3:1) extract. The values are means of biological duplicates on two different plates; highest value (μg/ml) is in parenthesis. B: Total production of fumonisin B1, B2 and B3 produced by Fusarium spp. after 7 days growth at different temperatures (15-42°C) on PDA. The concentration of fumonisin was detected in the methanol:water (3:1) extract. The values are means of biological duplicates on two different plates; highest value (μg/ml) is in parenthesis. At 37°C, the optimal temperature for growth by A. niger, the FB2 production was very limited. NRRL 567 had the highest production of the five strains at 25°C and 30°C; however at 20°C NRRL 2001 showed the highest production. This strain showed also the highest growth rate at this temperature. Four strains, NRRL 567, NRRL 3, NRRL 2001 and IBT 24634 had the highest FB2 production at 25°C, followed by 30°C, 20°C, and 37°C (Figure 1A). One strain, IBT 24631, differed from the other four, since it had a maximal production at 30°C, followed by 25°C, 20°C and 37°C. The concentration of FB1, FB2 and FB3 produced by Fusarium spp. is shown in figure 1B, and four of the Fusarium spp. had maximal production at 20°C: F. verticillioides IBT 9400, F. proliferatum IBT 41107, F. napiforme IBT 2932 and F. nygamai IBT 8554. F. oxysporum IBT 9514 had a maximal production of fumonisin at 25°C. Only three of the Fusarium strains, F. verticillioides IBT 9400, F. oxysporum IBT 9514 and F. proliferatum IBT 41107 had a measurable production of fumonisin at 15°C. F. napiforme IBT 2932 was only able to produce detectable amounts of fumonisins in the temperature range 20-25°C. At 20°C this strain had detectable concentrations of FB1, FB2 and FB3, but at 25°C only FB1 and FB2 were detected (data not shown). Even though there was growth of all five Fusarium strains at 37°C there were only in one case detectable production of fumonisins, this was produced by F. verticillioides. All strains of A. niger and Fusarium spp. were able to grow at all glycerol concentration (0-255 g/l) [see Additional file 2]. The growth of A. niger was only slightly reduced at aw 0.99; below this there was a continuous decrease in the growth. For the Fusarium spp. the growth was reduced at aw 0.99 and below, which was the same as the A. niger. All A. niger strains were able to produce FB2 at all glycerol concentrations tested (Figure 2). The effect of glycerol on the quantitative FB2 production for A. niger was very strain dependent, but in general the average FB2 production was reduced 8.2% per 0.01 aw unit (R2 = 0.97). 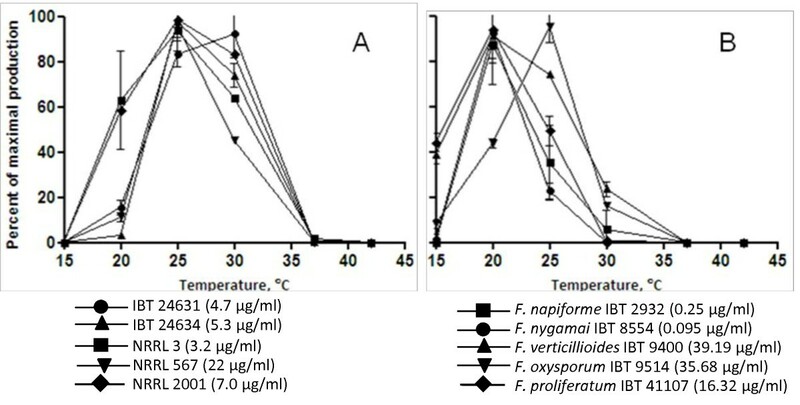 Three of the five Fusarium strains were able to produce fumonisin at all glycerol concentrations: F. nygamai IBT 8554, F. oxysporum IBT 9514 and F. verticillioides IBT 9400 (Figure 2). For two of these, IBT 8554 and IBT 9400, fumonisin production was increased up to 20% when glycerol was added. The other two strains F. napiforme IBT 2932 and F. nygamai IBT 8554 did not have a measurable production of fumonisins at aw 0.99 and 0.98. The average total fumonisin production was reduced 18% per 0.01 aw unit (linear regression R2 = 0.91). Effect of glycerol, NaCl and sucrose on the FB 2 production of Aspergillus niger and the total production of FB 1 , FB 2 and FB 3 by F. verticillioides, F. proliferatum , F. napiforme , F. nygamai and F. oxysporum. Strains have been incubated at 25°C for 7 days on CYA or PDA. The concentration of fumonisins were detected in the methanol:water (3:1) extract. The values are means of biological duplicates on two different plates, highest value is in parenthesis. For the five A. niger growth in the presence of NaCl was partially inhibited below aw 0.98 and all strains were able to grow at all aw tested. The Fusarium species had the highest growth rates at the highest aw and the growth declined until aw 0.93 where they were unable to grow. The FB2 production of all A. niger strains was stimulated when NaCl was added with FB2 being detected at all NaCl concentrations (Figure 2). The production peaked at aw 0.985-0.97 depending on the strain. A reduction of the FB2 production started at aw 0.97-0.94 and a comparison by a regression analysis to the cultures with no NaCl added the average production of FB2 decreased 13% per 0.01 aw unit (R2 = 0.98). The addition of NaCl clearly reduces the production of fumonisins by Fusarium (Figure 2), and was not detected in any culture below aw 0.955. One strain, F. napiforme IBT 2932, did not even have a measurable production of fumonisin when NaCl was added. But no correlations in the average decrease of fumonisin production was observed. We found that A. niger was able to produce FB2, in agreement with Frisvad et al. who showed that A. niger produced FB2 on the agar substrates RC and CYAS. On the other hand they did not measure any production of FB2 on PDA, whereas all five A. niger strains in the present study had a detectable, albeit low, production of FB2 on this substrate. Besides F. verticillioides, also F. napiforme, F. nygamai, F. proliferatum and F. oxysporum were found to produce fumonisins on laboratory agar substrates. The ability to produce fumonisins by these species correlates with findings of Nelson et al. and Kpodo et al. . However Nelson et al. described the production of FB1 by F. dlaminii, but this was not supported in our study. The findings of strains, capable of producing more FB2 than FB1 was also described by Musser & Plattner  as well as Leslie et al. . Apart from the four A. niger strains shown to produce FB2 by Frisvad et al. , additional 12 strains did produce this mycotoxin. Among the 18 A. niger strains investigated until now, only two have been unable to produce fumonisins in detectable amounts on the media investigated. Astoreca et al. found the optimal temperature for growth of A. niger to be 30°C, the highest investigated temperature in their study. In correlation to this study Palacios-Cabrera et al. also found that A. niger grew optimally at temperatures of 30°C, which was also the optimal temperature for linear growth in our study. Marin et al. found that the growth of both F. verticillioides and F. proliferatum was best at 25 to 30°C, which is in agreement of our results. According to Marin et al. F. verticillioides is more tolerant to temperature above 30°C than other Fusarium spp., however this was not obvious in our study. We found that the optimal production of FB2 by A. niger was at 25°C and in one case 30°C. Since there has been only one report of the fumonisin production by A. niger we have compared our results to the production of ochratoxin A. Our results correlates with an investigation of Esteban et al. , who showed that the optimal temperature for production of ochratoxin A by A. niger was at 20-25°C. In contrast to this, other authors found that the optimal ochratoxin A production in a synthetic grape juice medium was significantly better at 15°C compared to both 25 and 35°C . Findings in our study showed that at 20°C a significant decrease in the FB2 production occurred compared to 30°C. Earlier studies show that the optimal temperature for production of fumonisins by F. proliferatum is at 15-20°C where F. verticillioides prefers the higher temperatures of 30°C . This partly correlates with the results from our study, where both isolates showed the highest production at 20°C, but also produced fumonisins at 30°C. However fumonisin production by F. verticillioides was less inhibited than F. proliferatum by the higher temperature. Dilkin et al. and Alberts et al. found the optimal temperature for fumonisin production to be 25°C, followed by 20 and then 30°C. These results deviate from our results, because four isolates had the best production at 20°C and one at 25°C. Marin et al. described the production of FB1 by F. verticillioides at 37°C, which was also observed in our study. From our results a general pattern in the fumonisin production for both genera was observed, namely the maximal production of fumonisins being 5°C below the optimal growth. Comparing A. niger with the Fusarium spp., all A. niger strains grew better at all tested aW values. Leong et al. found the optimal aw for ochratoxin A production by A. niger to be aw 0.95, whereas Esteban et al found it to be in the range of 0.96-0.99, and that it was very strain dependent. These values are lower than those observed in our study for fumonisins where four of the A. niger strains had the highest production of FB2 at aW 0.99, with one isolate produced most FB2 at aw 0.98. Earlier studies have shown that the optimal aW for fumonisin production by Fusarium is in the interval 0.97-0.98 [27, 44]. The optimal aw value from our study was aW 0.995, which is a bit higher than the above mentioned aw values. Frisvad et al. also found that the addition of 5% NaCl (aw = 0.97) or 20% sucrose (aw = 0.99) increased the production of FB2 by A. niger. The present study showed that not all the used strains had the same pattern. Only four of the five strains had an increase in FB2 production at aw 0.97 compared to the zero sample when grown on NaCl. The last A.niger NRRL 3 had only an increase at aw 0.985 followed by a decrease at higher NaCl concentrations. The same was observed with sucrose where three strains had an increase in the FB2 production compared to a sucrose concentration of 3% in standard medium. The last strains had a decrease in the production at the previous mentioned sucrose concentrations. In conclusion it is clear that there is very large strain variability in fumonisin production at different water activities between the A. niger strains used in these experiments. Further studies on the effect of physiological variables on fumonisin production by A. niger is needed on large numbers of strains, due to large strain differences, and should further be backed up by studies of commodities where A. niger is common. This will lead us to a better understanding of how large a food safety problem fumonisin production by A. niger is. Only one report of fumonisins from A. niger in food (green coffee beans) has been reported, however the amounts were well below the regulatory limit . Fumonisin contamination in a series of foods, often contaminated with A. niger, may show to be an overlooked mycotoxin problem, since surveys have only mostly targeted corn and rice, based on the belief that it was only Fusarium spp. that could produce these important mycotoxins. The present study shows that the regulation of fumonisin production is very different in A. niger compared to Fusarium, with the latter preferring high aw (>0.99) and low temperature (20-25°C) and with A. niger preferring lower aw and higher temperature (25-30°C). Fumonisin produced by A. niger may be an overlooked health risk in foods not previously associated with fumonisins, especially because A. niger is known as a common food spoilage organism on a wide variety of foods . Unless otherwise is stated all solvents were HPLC grade, chemicals were analytical grade and water was purified on a Milli-Q system (Millipore, Bedford, MA). Media were prepared in 9 cm Petri dishes, each with 20 ml medium, and strains were inoculated by single point and dishes incubated in micro perforated plastic bags at 25°C for 7 days in darkness. The colony diameter measured is an average of the smallest and broadest diameter. All samples were as a minimum made in biological duplicates on two individually plates. All strains (Table 2) were from the IBT culture collection at Center for Microbial Biotechnology, DTU. The Fusarium strains were selected from species known to produce fumonisin. Five A. niger strains were selected, for the physiologically study, three of these have been used in industry according to collection databases (NRRL 3, NRRL 567 and NRRL 2001), whereas the last two were isolated from black pepper (IBT 24634, IBT 24631). The last 9 strains were only used for validation. All A. niger strains were characterized and identified using a polyphasic approach, as in our previous articles [46, 47], in order to ensure that they were A. niger sensu stricto. Besides this the ITS region and parts of the β-tubulin and calmodulin genes were amplified and sequenced as described previously [48–50]. Results shown in Table 2 (public database numbers of the strains). Fungal isolates used for fumonisin production. CBS: Centraalbureau voor Schimmelcultures, Utrecht, The Netherlands. IFO: Institute for Fermentation, Osaka, Japan. MRC: South African Medical Research Council, Tygerberg, South Africa. NRRL: Northern Regional Research Laboratory, Peoria, Illinois, USA. The media used for fumonisin production were: potato dextrose agar (PDA) , Czapek yeast autolysate agar with 5% NaCl (CYAS)  and rice meal corn steep liquor (RC) agar . The fumonisin were extracted using the method previously described by Frisvad et al. . Six plugs (D = 6 mm) were cut out of the colony from the center and in a radius towards the edge of the colony and transferred to a clean 2-ml vial, 800 μl of methanol:water (3:1) was added, and extracted by ultrasonication for one hour. All extracts were filtered through a 13 mm PTFE 0.45 μm syringe filter (National Scientific, Rockwood, Tennessee) into a new vial and used directly for analysis. The LC-MS analysis was performed on a LC/MSD VL single quadrupole (Agilent, Santa Clara, California). The separation of 3 μl extracts were done at 40°C on a 50 × 2 mm, i.d. 3 μm size, Luna C-18 (II) column (Phenomenex, Torrance, California), fitted with a security guard column, and using a water:acetonitrile (both containing 20 mM formic acid) gradient at a flow rate of 0.3 ml/min. The gradient started at 30% acetonitrile, and increased to 60% acetonitrile over 5 minutes. During further 1 minute it was increased to 100% acetonitrile and maintained here for 2 minutes before the gradient in 1 minute was returned to starting conditions and kept there for 5 minutes. The mass spectrometer (MS) was operated in positive electrospray ionization mode and was automatically calibrated on the instrument ESI tuning mix. The MS was used in selected ion monitoring (SIM) mode for measuring [M+H]+: FB1 (m/z 722), FB2 and FB3 (m/z 706). The capillary voltage was held at 3000 V, the fragmentor voltage was at 70 V and the nebulizer pressure was at 2.5 bar. The drying gas flow was 12 l/min with a temperature of 350°C. The detection limit was measured to 0.01 μg/ml from dilutions of a FB1 and FB2 certified standard (Biopure, Tulin, Austria), with concentrations of 50.2 μg/ml and 51.0 μg/ml, respectively. The fumonisin concentrations of the extracts were calculated from a standard curve created from dilutions of the FB1 and FB2 standard mixture. FB2 presence was further confirmed in selected extracts by LC-MS/MS  and LC-HRMS . The five different extraction solvents tested on A. niger NRRL 567 and F. verticillioides IBT 9400 were: i) methanol:water (3:1), ii) acetonitrile:water (3:1), iii) water at room temperature (25°C), iv) water at 100°C and v) methanol:dichloromethane:ethyl acetate (1:2:3) with addition of 1% (v/v) formic acid. The extraction process for [i-iv] was the same as mentioned above. For the fifth extraction solvent there were a few extra steps: After ultrasonication the extract was transferred to a new vial and the organic phase was evaporated in vacuo. The residue was re-dissolved by ultrasonication in 500 μl methanol for 20 minutes. All extracts were filtered through a PTFE 0.45 μm syringe filter before analysis. FB2 extraction was validated by spiking 5 plugs of two non-fumonisin producing strains of Aspergillus niger (IBT 19345 and IBT 20381) with 100 μl FB2 standard containing 5000, 2500, 1000, 500 and 100 ng FB2. After spiking, the plugs were left for 2 hours, and extracted as described above. Recovery was determined by comparing the slope of the spiked curve to slope of the curve from diluted samples in methanol-water (3:1). Five blank samples of the 2 strains were also analysed. Reproducibility of extraction efficiency was further determined from 7 A. niger strains (IBT 4983, IBT 18741, IBT 19558, IBT 26774, IBT 28086, IBT 28104, NRRL 567) selected from high, medium and low fumonisin producing strains. Five replicate plates were made from each strain and extracted as described above. To assess the effect of temperature on the production of fumonisins, A. niger strains were inoculated on CYAS and Fusarium strains were inoculated on PDA. The plates were incubated in darkness at 15, 20, 25, 30, 37 or 42°C respectively for 7 days. The fungi used were the five A. niger strains listed in Table 2, and the following Fusarium species: F. napiforme IBT 2932, F. nygamai IBT 8554, F. verticillioides IBT 9400, F. oxysporum IBT 9514 and F. proliferatum IBT 41107. For investigation of the effect of glycerol, NaCl and sucrose on the production of fumonisin the following experiments were performed: A. niger was inoculated on CYA and Fusarium on PDA with different concentration of glycerol (0-255 g/l), salt (0-125 g/l) and sucrose (0-530 g/l). For the Fusarium-sucrose experiment, the PDA mixture was made from boiled potatoes instead of a commercial blend. In short terms, 200 g potatoes was peeled and diced and autoclaved at 121°C with 1 liter of water, 15 g agar and 0-530 g sucrose. The corresponding measured water activity (aW) values of the media are shown in Table 3. The water activity was measured with an Aqualab (ADAB Analytical Devices, Stockholm, Sweden). There were no measurable differences in the water activity of the CYA and PDA media. The fungi used were five A. niger strains, and the following F. napiforme IBT 2932, F. nygamai IBT 8554, F. verticillioides IBT 9400, F. oxysporum IBT 9514 and F. proliferatum IBT 41107. The values are means of the triplicates plus/minus the standard deviation. This work was funded by The Danish Food Industry Agency (3304-FVEP-07-730-01). Dr. Techn. A.N. Neergaards og Hustrus Fond is acknowledged for support for the LC-MS/MS instrument. We also thank S. W. Peterson, National Center for Agricultural Utilization Research, Peoria, IL, USA, who kindly provided the NRRL strains used. JMM, UT and JCF designed the study. JMM performed the experiments, KFN the analytical part and RAS the molecular genetic studies. All authors contributed in drafting the paper and have read and approved the final manuscript.